Penghu Airport (IATA: MZG, ICAO: RCQC), also known by the previous name Magong Airport (Chinese: 馬公機場; pinyin: Mǎgōng Jīchǎng; Pe̍h-ōe-jī: Má-keng Ki-tiû), is an airport in Huxi, Penghu County, Taiwan. The operation of the airport originally started in 1957 with focus on military personnel and cargo transportation. The construction of the new terminal began in 1966 and was subordinate to Kaohsiung Airport. The airport was officially established as Type C airport and began operations on 1 August 1977. In August 2004, the second phase of the airport new terminal was completed, which include the waiting room and terminal building. In June 2015, a new instrument landing system at the airport was inaugurated which was expected to improve safety, reducing the visibility requirement for the runway from 1,600 to 1,200 metres. On 23 July 2014, TransAsia Airways Flight 222 crashed during a second attempt landing during bad weather. 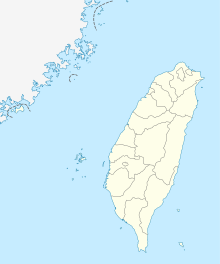 The flight originated from Kaohsiung International Airport. The ATR 72-500 was carrying 58 passengers. 11 survived the initial crash but one succumbed to their injuries during the following days. On the ground, 5 were injured and two homes caught fire due to the crash. ^ "馬公市公所-英文版-". mkcity.gov.tw. Archived from the original on 2012-07-16. Retrieved 2012-06-05. ^ "Magong Airport gets new instrument landing system". focustaiwan.tw. ^ a b "International Charter Flight". Penghu Airport. Retrieved 18 February 2019. ^ "Mandarin Airlines adds new domestic route from Nov 2016". routesonline. Retrieved 19 October 2016. ^ "國內航線班機載客率及市場占有率－按航線分". www.caa.gov.tw. Retrieved 6 March 2019. Wikimedia Commons has media related to Magong Airport. This article about a Taiwanese airport is a stub. You can help Wikipedia by expanding it.